The purpose of this study was to determine whether ingestion of a small bolus of ice slurry (1.25 g kg-1) could attenuate the reduction in maximal voluntary isometric contraction (MVC) torque output during a 2-min sustained task following exercise-induced hyperthermia. On two separate occasions, 10 males (age: 24 ± 3 years, VO2peak: 49.8 ± 4.7 ml kg-1 min-1) ran to exhaustion at their first ventilatory threshold in a hot environment (34.1 ± 0.1°C, 49.5 ± 3.6% RH). Prior to and after exercise, subjects performed a 2-min sustained MVC of the right elbow flexors in a thermoneutral environment (24.6 ± 0.8°C, 37.2 ± 4.5% RH). The post exercise MVC was performed immediately following the ingestion of either 1.25 g kg-1 of ice slurry (-1°C; ICE) or warm fluid (40°C; CON), in a counterbalanced and randomised order. Run time to exhaustion (42.4 ± 9.5 vs. 41.7 ± 8.7 min; p = 0.530), and rectal (39.08 ± 0.30 vs. 39.08 ± 0.30°C; p = 0.934) and skin temperatures (35.26 ± 0.65 vs. 35.28 ± 0.67°C; p = 0.922) and heart rate (189 ± 5 vs. 189 ± 6 beats min-1; p = 0.830) at the end of the run were similar between trials. Torque output during the post-exercise 2-min sustained MVC was significantly higher (p = 0.001) following ICE (30.75 ± 16.40 Nm) compared with CON (28.69 ± 14.88 Nm). 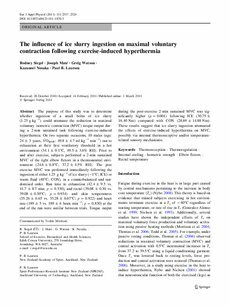 These results suggest that ice slurry ingestion attenuated the effects of exercise-induced hyperthermia on MVC, possibly via internal thermoreceptive and/or temperature-related sensory mechanisms.